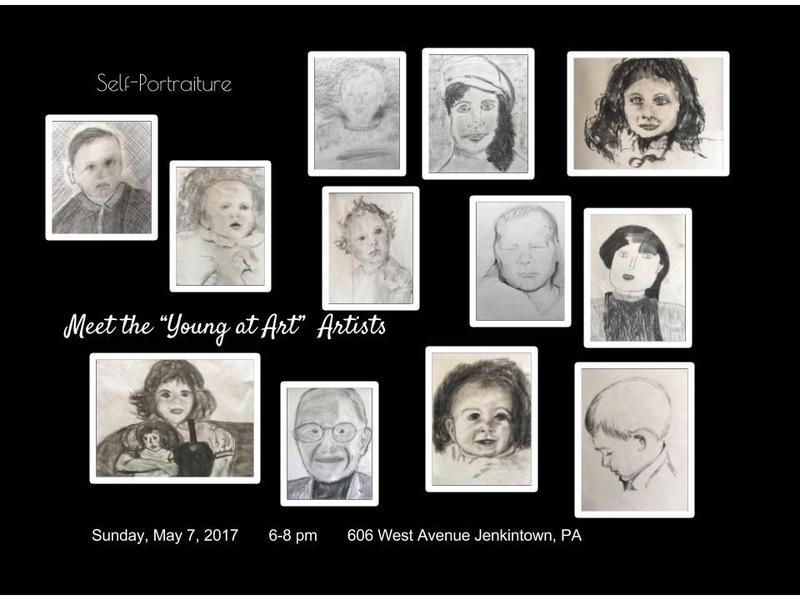 Today, AW students from 2016-2017 will have their work featured in the Student Exhibit of the Jenkintown Festival of the Arts. The festival starts at 1 pm and runs until 6 pm. The Student Exhibit can be found at Yorkway Place, a quaint alley off of Johnson Street in the heart of town. 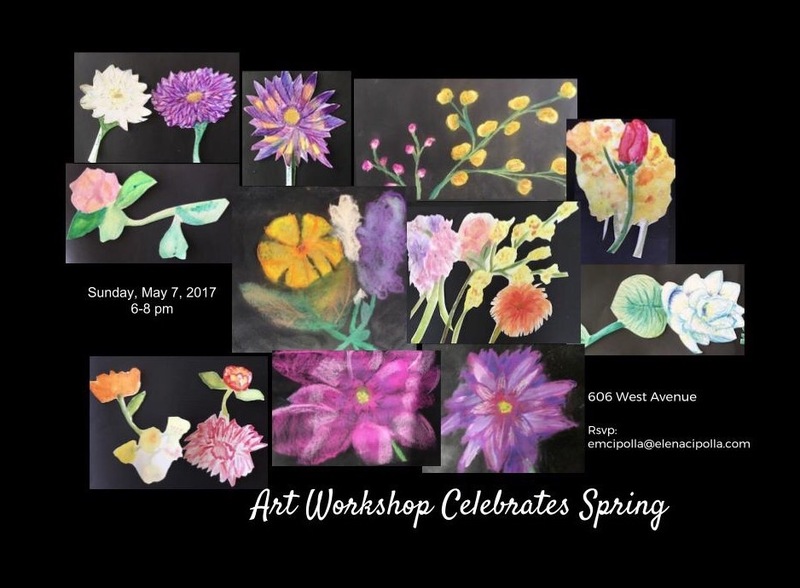 Please come by and view the work, as well as the work from Jenkintown Elementary and Abington Friends School. Now that summer is winding down, it is time to get ready for fall! Art Workshop and Young at Art classes start the week of September 11th, and run through the week of November 13th, with our evening show and reception scheduled for Sunday, November 19th. Hold a place in the program, by visiting the Art Program Registration page, and registering. Art Workshop is open to students in grades four through high school. There are students from many different schools who participate in the program. All that is required is a desire to create! Classes are held on Monday, Wednesday, and Friday afternoons in Jenkintown at St. Joseph the Protector School from 3:30-5:15 pm. Supplies are included in the fee. Invitation displaying the Monday section of Fall 2016 Art Workshop. The Fall semester will be 10 weeks long. A variety of mediums will be used , exposing the artists to different methods of creating. Each section is limited to 10 students. The semester culiminates in an art show, displaying the work created by the artists. Young at Art is an adult art program which meets on Tuesday mornings from 10-11:30 am. Adults of any age and skill level are welcome. The adult classes run for six weeks, and will also be displayed in the Fall show on Sunday, November 19th. Contact Mrs. Cipolla at emcipolla@elenacipolla.com if you are interested in the class. 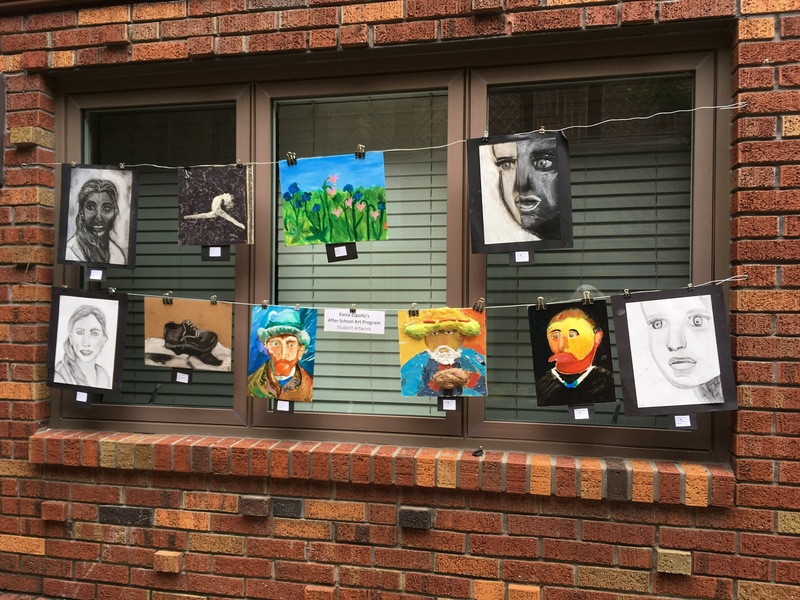 Art Workshop students from the 2016-17 school year are invited to participate in the 2017 Jenkintown Festival of the Arts, Student Exhibit. The winners from last year are displayed below, click on each of the images to view the artist! Mrs. Cipolla will be accepting work the week of 9/11. Up to four pieces can be submitted for the show. The show is juired, with prizes awarded in the high school and middle school category. Art Workshop has had winners ever year! 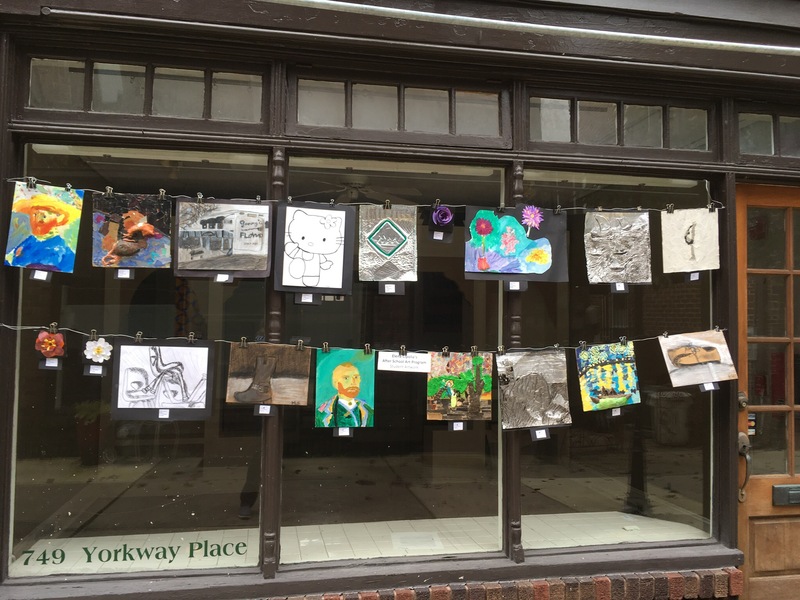 The work will be displayed in Yorktown Alley, off of Johnson Street in the heart of Jenkintown on Sunday, September 17 from 1-6 pm. Art Workshop eighth graders are encouraged to start organizing their work for high school art scholarships. Mrs. Cipolla will be happy to meet with you and help you put your work together. 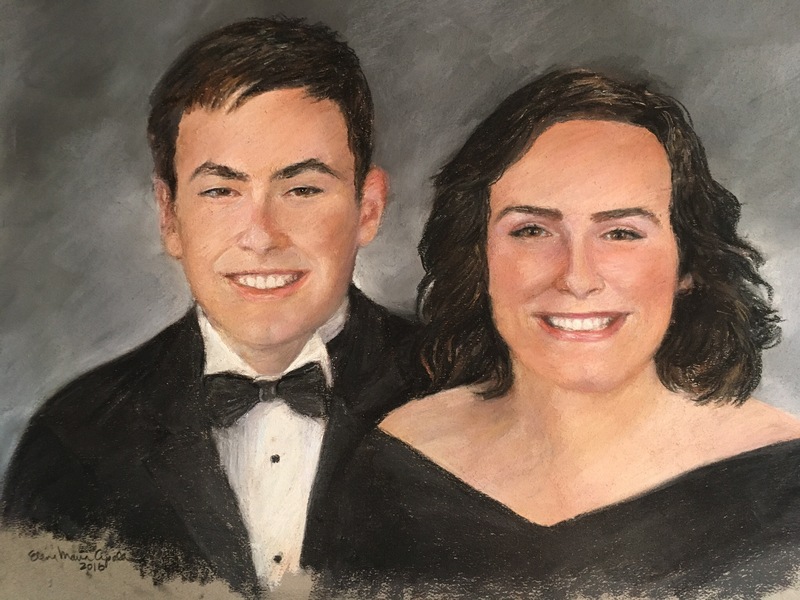 Area private and archdiocesan schools offer art scholarships to incoming freshman. The requiremnts vary by school but often require a teacher letter of recommendation and 10-15 pieces of work, displayed in an organzied portfolio. Most of the applications are due in November and December. Contact Mrs. Cipolla to set up a time! Looking forward to another great year of creating art! This weekend I did something I had never done before–shipped a pastel work to friends in California. When I was approached about doing the work, the problem of getting a pastel across the county was my first concern. Pastel are delicate. Once they are done and fixed, they have to be handled with great care until they are put behind mat board and glass. Internet research revealed several websites with advice on how to ship a pastel piece. I am most grateful to artist Karen Margulis at http://kemstudios.blogspot.com/. She had a detailed entry with steps and links to the types of materials used. My customer was good enough to fashion a wooden crate just slightly bigger than the finished piece, 19″ x 25″. He shipped it to me, and along with Karen’s advice, we were able to ship the piece out this week. So make sure you seek the advice of other artists! Starting on January 9, 25 Winter Art Workshop artists, grades 4-10, are creating works and learning from Vincent van Gogh. Texture, line, movement, and color are the key elements the students will take from van Gogh and create on their own. The first week was an exercise in line and texture. Using inked preliminary sketches of van Gogh, the students created two 10-minute ink “sketches” using a nib and ink. They selected one of the images to create a work in tooling metal and ink. The work was outstanding. The students learned how texture can create depth in a work. With some experimenting, they also learned how to control the ink they applied to their tooled images. Van Gogh’s images were compelling, and he created many still life paintings linked to the lives of real life people. His painting of work boots has been analyzed by many. Some think they were boots he purchase on his own, and then wore in a rainstorm to give them character. Others say that they boots were purchased at a flea market, but didn’t fit him so he painted them. The Winter AW students used their own shoes for the pieces they created in week two. First, they drew up to three different charcoal studies. The final piece was created in black and white paste on cardboard. The cardboard supplied the middle tones. Weeks three and four were devoted to a group 3D painting. The students and their teacher learned much during this project. Each group of students had a van Gogh, or a van Gogh inspired work, which was gridded and cut into strips. The student had no idea what the work would look like until they completed their portion of the project and put the pieces together; this work was done in colored pencil and supplied the background for the final work. 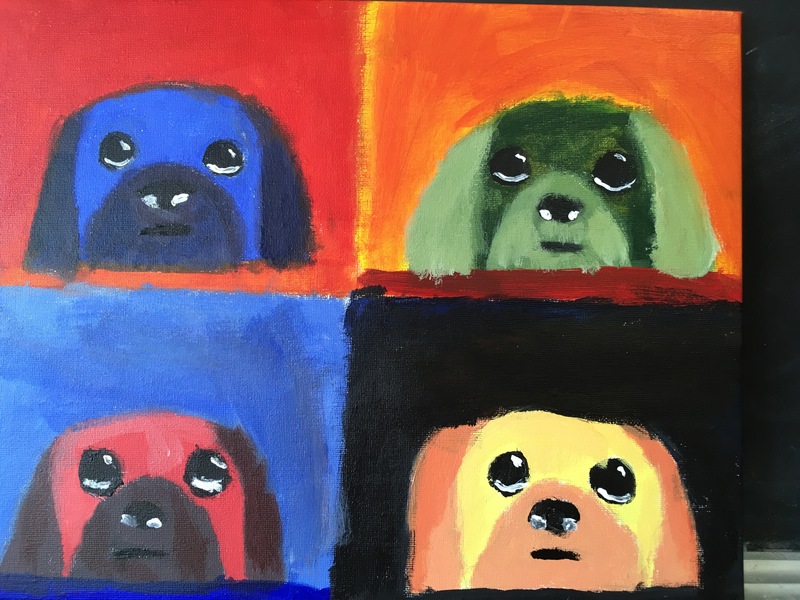 As a group, they selected the areas of the painting they wanted to stand out. Four inch wooden discs were sanded, primed, and painted, and installed inside the colored pencil work. These three works will permanently be part of our classroom display. The edges of the discs lended much dimension to the piece. The students are currently working on a 3D mixed medium piece, which will take them a few session to complete. Van Gogh’s Sunflowers and his self-portraits will also play a part later in the semester. We don’t want to give away too much! Look for your show invitation in about two weeks, and mark your calendar for March 19th for our 6-8 pm show and reception. On Sunday, November 13th, the artists in the Fall Art Workshop and Young at Art programs will display their work in the Fall show and reception. The show runs from 6-8 pm and all students are encouraged to invite their friends and family members. During the nine week Fall Art Workshop semester, the students created works in a variety of mediums. The theme “It’s All Black and White to Me” had the students exploring how values can create compelling work. The artists used ink, pencil, charcoal, colored pencil, pastel, acrylics and collage during the semester. Their subjects included cartoons, landscapes, still life, and people. 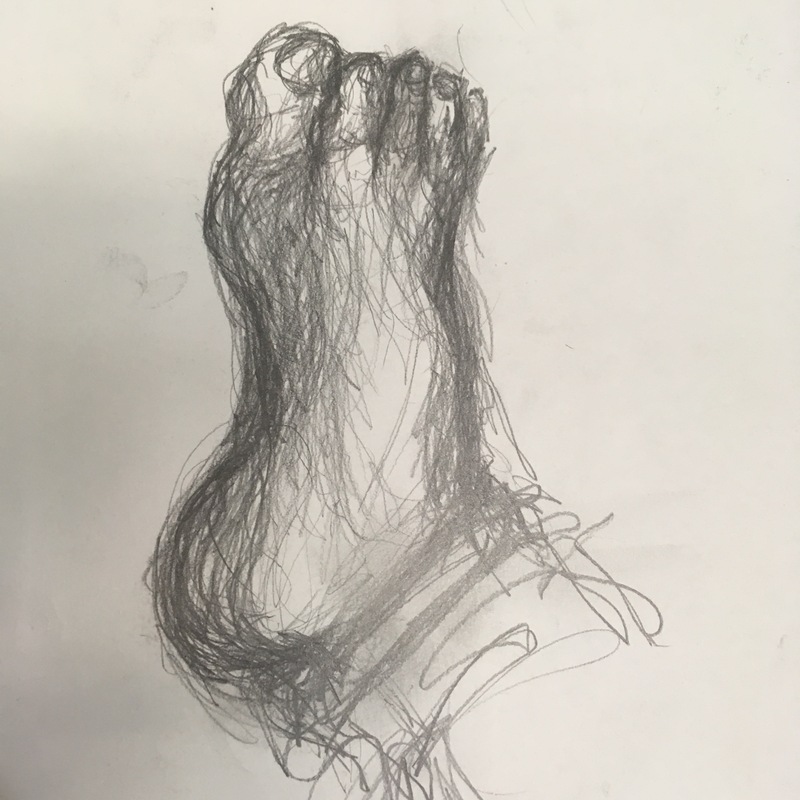 Young at Art artists explored the human figure in a semester of figure drawing. The artists worked from life and from photos using a variety of mediums. Sunday, September 18 was the sixteenth Jenkintown Festival of the Arts. For the last five years, Art Workshop students have been part of the Student Exhibit. Since 2014, the exhibit has been juried. 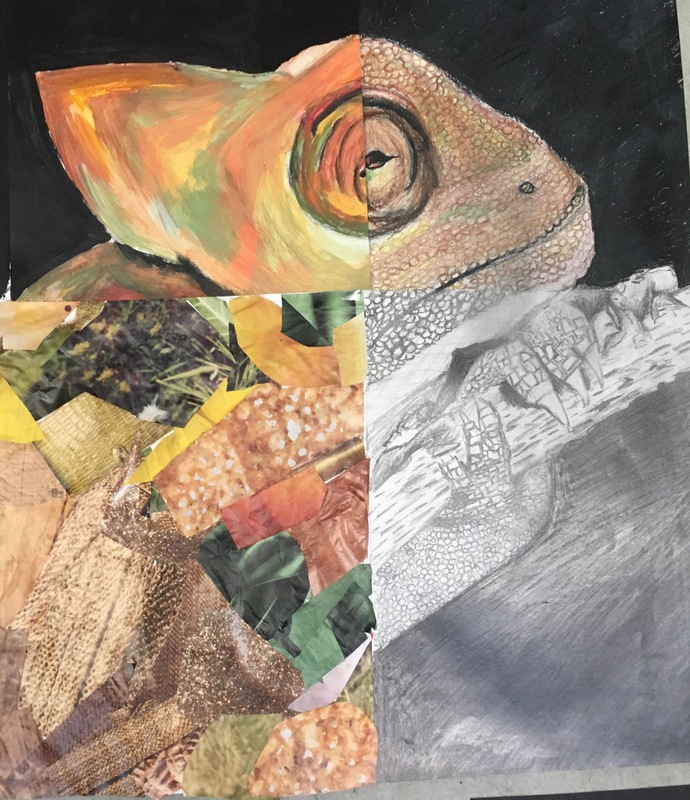 This year, Olivia K. won top honors for her multi-medium lizard, Tessa S., 3rd place for her sketch of her foot, and Georgia G., an Honorable Mention for her Andy Warhol style painting of her dog. 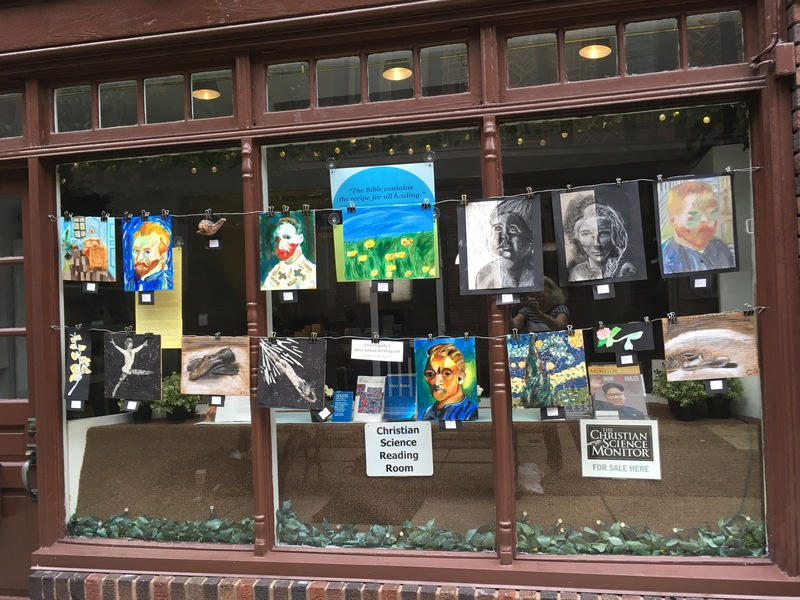 This year, due to the unsettled weather, the work was exhibited at the Jenkintown Dance Company, who were so good to lend us their wonderful space for the display. Congratulations to the 21 Art Workshop artists who brought their work back for the show! The other school submissions were from Jenkintown Middle and High School and Abington Friends School. The show is always a wonderful opportunity for the students and their teachers! Fall Art Workshop will begin the week of September 12 and run through the week of November 7th. Registration is open now. Classes will be held on Monday, Wednesday, and Friday afternoons from 3:30-5:00 at the StJP Jenkintown campus. Students in grades 4 through 8 can participate. Each section is limited to 10 students. Click on the Art Program Registration page to register! Below are samples of some of the student work created during the most recent three Fall semesters. Click on each individual tile to reveal the artist, medium, and year created. 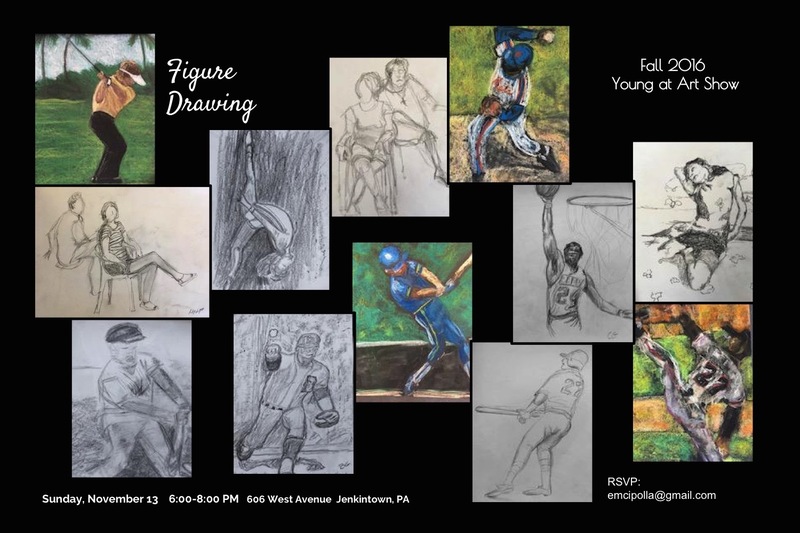 Look for the AW students’ work in the 2016 Jenkintown Festival of the Arts on Sunday, September 18th!